The Torah is a spiritual instruction, through following it a person gradually attains the end of the correction of the soul. At first glance many parts of the Torah seem to be repetitive, but these repetitions are on the next, higher level. When I went to school, for example, I understood the laws of physics without a problem and they seemed quite simple. I wondered how deeper and more complex they were when I studied them at university, since they seemed the same but it was on a totally different level of study. Therefore, it is impossible to fulfill the laws of the Torah if you are not on the matching spiritual level. It is impossible to attain the next level if you haven’t prepared your five senses for it. It is like teaching a dog morality. Of course, he can perceive your mood instinctively, but he will never perceive the moral message. If you want him to behave properly you have to descend to his level and make it understood through reward and punishment what is allowed and what is not. He will perfectly understand that he shouldn’t take food from the table because he will receive a blow, not because you are expecting guests and the table is set for them. Explaining the systems of prohibitions to a human being can take on totally different forms of morality, which means that everyone understands according to his level. Therefore, although the stories in the Torah are conveyed in the same words, their levels are very different, just like the difference between the perception of a man and a dog. Question: What does the processing of the spiritual level mean? Answer: It means that you have properly combined and connected all the desires that can be used on a certain level, made them into a general desire (a general vessel) and have received in it the measure of Light in order to bestow that you should receive on that level. When you work in order to bestow, you create for others the attribute of love and mercy. This is the work on the given spiritual level. The same thing repeats on the next level but with totally different conditions. Question: What is Kabbalah’s view on health? Answer: All types of health disciplines such as physiology, ethics, morals, and psychology are the essence of the balanced system called the human being. All these disciplines are interconnected. Based on our life experiences we know how psychology influences physiology and visa versa. If we take care of our “I,” the highest level of the human in us, we influence the lowest levels of the subsystems. Therefore, Kabbalah tells us that first and foremost the soul has to be corrected. This is the balance of self needed in order to balance oneself out with the rest of the world and be in harmony and homeostasis with it. Then the lowest physiological systems will come to balance due to the upper system’s influence and gradually arrive to be in order. This is the cure, according to Kabbalah. The same point of view exists in Eastern healing practices. They state that the human being is a micro world, and as such must be in complete internal balance on all levels as well as in external balance with the world. To reach such equilibrium, we must have correct education and societies, which are the shell in which we exist and with which we have to interact while being fully integrated. This will naturally balance us out internality. This is why treatment of a person should not come from the elimination of all kinds of symptoms, but only from the upper levels that, according to the hierarchy, will bring the entire system into balance from the top down. We don’t need to delve into the bodily physiological properties; we have to bring the soul into balance. The body will then comply and regain health all on its own. Treatment of separate body organs doesn’t bring any results since we have no idea how they are even related. It’s like fixing one thing, but breaking another. Any medication itself is a poison, and it is not for nothing that the symbol of medicine is a poisonous snake. We see that taking medication doesn’t lead to a complete cure and a person continues to be sick. A person’s soul must be balanced in order for a person to be healthy. As saying goes, a sound mind is in a sound body. Comment: Just like in ancient Chinese medicine, a doctor will receive his payment for a person being completely healthy and not just for treating separate organs. Answer: Yes, but this will be a completely different doctor. It won’t be a doctor-Kabbalist, but it will be an instructor who will correctly tune a person into homeostasis with the environment. Answer: I would say that it is not money but want, desire, and need that run the world. Money only covers the desire and even eliminates it by fulfilling it. After I fulfill my desire with the help of money, I don’t feel good. Once again I must want something, yearn for it again. What is the pleasure that is most attractive to me? It is in connection and unity with society. The pleasure there is not only attractive but also endless; it only continues to grow. This is what is special about fulfillment from the environment in comparison to all other fulfillments. Answer: That’s right. In our world money buys everything except health, loyalty, dedication, and dominance over the angel of death. To transfer this concept to the new thinking, it will be necessary to rise to another level of explanation. If instead of with money, I cover the needs and deficiencies in my relationship, then this is true loyalty and devotion. Thanks to new attitudes, love is developed, the same needs and fulfillments that were hidden by money and never fulfilled. For these needs are relevant to loyalty, love, and freedom from the angel of death. Answer: We don’t acquire independence by being able to fulfill all of our constantly changing deficiencies. I am free only when I am found above the deficiencies and not within them. This is called the right-coated screen. If I own a bank and everything that I want I cover with money, I am not free because I am always engaged in this activity: covering my needs with money. But if I am found above my deficiencies so that I don’t feel them, I also have no need for money. Question: I don’t need anything? Answer: If I am above the desire to receive, let’s say in a society in which everyone is connected together and supplies each other with everything necessary, then I don’t live in my deficiencies but in the deficiencies of the society. In this case, I don’t feel that I lack the money to fulfill myself. I fulfill others, and the others fulfill me. If we live like this, then I don’t feel want because I am found above it. I care about everyone and everyone cares about me; in this way I feel that I am free. And everyone feels themselves free because they are concerned about everyone. So we don’t live under the pressure of want, and we are truly free. 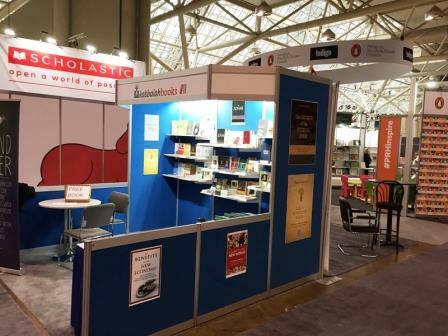 From November 13th thru November 16th, the largest exhibition hall in Toronto hosted the Toronto International Book Fair, in which 400 authors and a large number of book publishers and distributors took part. 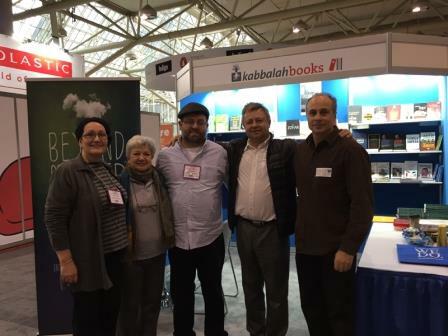 The Bnei Baruch Toronto group represented the Kabbalah Books booth. 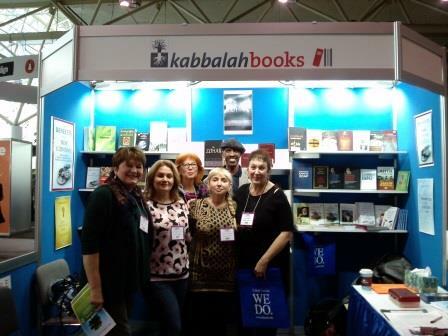 The whole Toronto group was involved in this event, taking shifts at the booth, telling visitors about the books and Kabbalah, distributing gift bags imprinted with the words “I don’t exist – only We!” filled with “kabbalah.info” pens and flyers, and registering people interested in the Bnei Baruch Kabbalah Education Center courses. The stand was very popular with the public. 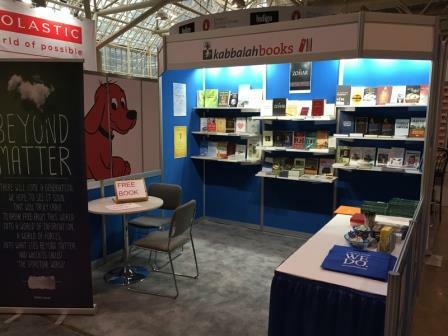 Our friends worked without breaks and rest, meeting an endless stream of visitors and answering their questions about Kabbalah. 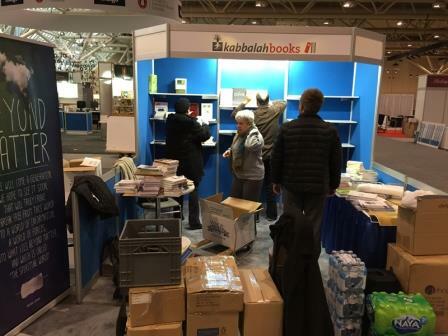 Everyone who was seriously interested received a gift, the book Basic Concepts of Kabbalah. 250 free books were given in the first half-day of the fair. A gift package and the book Attaining the Worlds Beyond were presented to Canadian astronaut Chris Hadfield. The book fair has attendance of 30,000 people throughout the 3 days. On the spiritual path I will always discover how much my group, my group of ten is awesome and terrible. I don’t agree with any of the friends; I am ready to tear them all to pieces, and together with this, afterward, with the help of the Light that Reforms, we merge to such a degree that there are no limits to our unity. Nothing separates us even by a hair; all of us are welded and consolidated together with one heart. It is said about this in The Book of Zohar: (Psalms 133:1): Behold, how good and how pleasant it is for brethren to dwell together in unity also. These are the friends when they sit together and are not separated from each other. From the start they seem like warriors who want to kill each other. And after that they return to being with love and brotherhood. The Creator, what does He say about them? “Behold, how good and how pleasant it is for brethren to dwell together in unity also.” The word “also” comes to include the Shechina (divinity) with them. (Zohar, “Acharei Mot,” Item 64-65, HaSulam Commentary). The Shechina is the place where the Creator is revealed, the shared desire of the friends, their common heart. About this it is said: (Proverbs 10:12) “…love covereth all transgressions.” In the beginning it is necessary to discover all the oppositions and above them love, the Light, (Ecclesiastes 2:13) “…as far as light excelleth darkness.” Otherwise, without feeling the intensity of the separation first, we don’t feel the intensity of the unity. We can see the result of this approach when according to the principle of the unity of the Creator, that (Deuteronomy 4:35) “…there is none else beside Him” and He is the “good and beneficent,” we begin to behave differently at work, in the family, with our children, with our neighbors. In general we begin to look at the whole world differently. In our group we hold this line permanently, and in other places as much as possible. It is necessary to expand the circles of the right relationships to what is around us more and more such that ultimately in all of reality we will see only the Creator who manages everything, sends everything, and finishes everything. Today we study nature only through the power to receive, which is our initial, primary attribute. I always aspire to receive what is good for me. This is how I live and this is what I am like; this is my conscious and my subconscious thinking and I cannot think any other way. This is because I was born out of the evolution of the still, vegetative, and animate nature. Every matter aspires to differentiate and to classify itself in the most efficient way by resisting anything that can cause it harm and resting peacefully as tightly and as safely as possible to the other parts. Therefore I constantly worry about how to provide everything that I need in the best, safest, and most comfortable way compared to others. This attribute is typical of all forms of matter including the still nature that passively guards itself. On the vegetative level the environment is already used: organisms produce useful substances from the soil, consume oxygen or carbon dioxide, etc. Metabolic processes take place in them and they know how to use the environment in order to grow at its expense. Creatures on the animate level grow not only thanks to the still environment but also thanks to the vegetative and the animate. Animals eat plants and other animals. At the same time, all the organisms develop and multiply, and it is all based on the initial desire to guard themselves as much as possible by keeping away from anything that is harmful and getting closer to what is beneficial. All this is the essence of the egoistic force of receiving that is in every creature. As for man, he has succeeded in that sense more than all the other levels. He finds pleasure in taking resources from others even if he doesn’t need them since it raises him and makes him more important compared to others around him. He gets rid of and drives away those who can harm him and keeps only those he can benefit from close to him. He doesn’t assess himself in the framework of the closest environment but compared to the whole world throughout time. The human ego is highly developed, and its perception, its view of the world, is rooted in our internal program. No matter what I perceive by my senses, I see only what I want to see and not what actually happens in reality. I don’t pay attention to anything that doesn’t belong to my corporeal existence, to my desire to receive. Neutral things that are not harmful or beneficial to me are not in my field of vision. I simply cannot identify them. Question: Research shows that Israeli youngsters spend up to four hours a day on the Internet, and according to these indicators, Israel is placed as one of the first in the world. In what way does this cyberspace pull so strongly? Answer: The main reason for all changes that take place in the society is our inner desire. In the beginning it finds pleasure from running around the Internet and social networks, and afterwards begins to separate between valuable things and unnecessary things. It is the same with TV. When there were only two channels, everyone watched only them. Today there are hundreds of programs but only a few spend time with them. But now people sit for hours on the Internet. I am sure that this also will pass. In another few years the youth of that day will not find anything attractive in spending time in this way. In the end, why do they connect to the Internet for so many hours? For a few “likes”? No. The youngsters are attracted to the feeling of a permanent connection, like ping pong. Let’s think of how to correctly take advantage of this desire in order to bring them to a new communication, a more internal one. To do so you have to develop new programs and create these Internet fields where young people will have an emotional link between themselves. And this needs also to be in the physical world, not just in the virtual one. We need to organize all kinds of festivals that will take place in those places where people can connect freely between themselves, i.e., roundtables, discussions, and performances. We need to constantly create the conditions for people for connecting and unity, filling both time and space. Question: On the one hand, the youth are in social networks. On the other hand, it is very hard for them to connect between themselves. Answer: Correct. The media distances people. It is easier for me to talk on the phone than to have “face-to-face” conversations. I feel safe behind the screen that’s between us. As a result of this, the gap between me and the outside world is growing. But there is no bad without good: The recognition and disclosure of evil has to take place. And I truly hope that it will happen quickly. Question: Why is our whole life a matter of overcoming? Answer: It is especially that way so that we will learn to channel our desire anew, which is an actual rebirth. I have to clarify what is important for me in life. I have 24 hours a day, so what would I like to do during this time? How do I want to fill these hours with the most beneficial activities? Then I begin to reflect and think about the meaning of life. It is because life is made of these 24 hours every day. Is there a purpose to my existence that makes my life worth living? I try to understand what I should fill my day with and what is a waste of time. Thus, I clarify the importance of a certain state and this is where I have to overcome in order to increase the importance of the state. I constantly work on this clarification by determining the goal and everything that is related to it more and more accurately. If I decide to become a famous musician, for example, I have to dedicate all my time to that. I have to examine and to study this matter, to listen to different types of music and to engage in everything that is related to this occupation. Thus I clarify it more and more by building up inside me a desire and an attraction to be a famous musician, that it totally dominates me and I only think about it. I don’t care and don’t worry about food or clothes, rest or entertainment. I want one thing only: music! It is because I have made it so important for me by myself. I have built up this importance artificially, and this is called overcoming since I have formed a desire inside me, a need, an attraction for something that wasn’t important at all for me before. Now it isn’t an effort at all to constantly yearn for music, to work and to improve my skills, to rehearse ten hours a day as a real musician is required to. It is the same in every other area: in education, in family life, at work, in any way I advance and organize my life. If we want to achieve something, we shouldn’t force ourselves to do what we don’t want to. We want a good and pleasant life and so we have to build up inside us the desire for what we have to do. Overcoming is turning what we have to do into what we want to do! If I build up inside me a desire for what I have to do anyway, this occupation will cease to be difficult. This is how I can change my life by turning it from hard work into a continuous adventure, a continuous vacation. If I channel my desire anew, all the difficulties will disappear. I will not have to force myself to work and to suffer by making an effort each time I perform a certain action and by overcoming myself each time; this type of work will become desirable. The overcoming will only be needed in order to make it important for me.